Santacon is tomorrow in San Francisco, LA, New York, and many more cities! Get details here and get ready to get jolly! I just uploaded my Santacon video to YouTube. What a great Santacon this year – despite the 26 degree weather! Make sure you watch for the North Pole Dancer at 0:39. Ho Ho Ho. 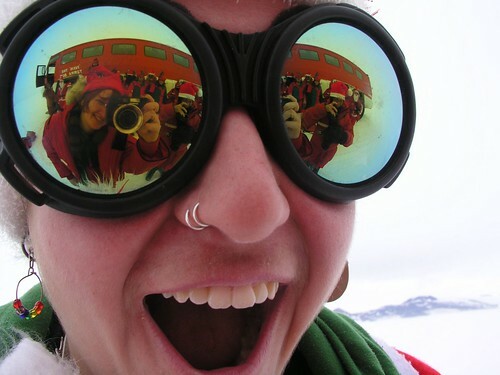 Tags: Antarctica, art installation, crazy science!, Santacon, volcano, who knew? So a year or two ago when looking for info about Santacon, I found a link to a Santacon event put on in friggin’ Antarctica. There is an amazing Flickr set of photos of these shennanigans from Flickr user Sandwich Girl. I recognized the name Sandwich Girl while looking at the Flickr pool of the Bush St. becoming Obama St. Way to be involved in both a secret street sign mission and a South Pole Santacon. Sandwich Girl, whoever you are, you get two thumbs up and a gold star. In the Flickr set you may notice a bunch of Santas playing on crazy blue orb thingys. Turns out its an art installation! Who knew? A volcano in Antarctica!